"Lorelei returns to Merrilyn Technologies to claim her inheritance and fulfill her contract with the FBI. " Nightshade Assassin - Strings of Retaliation has not been tagged yet. 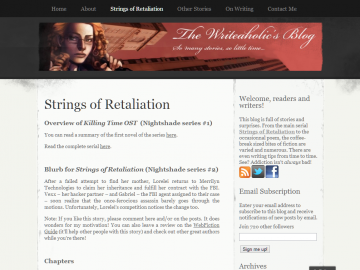 Help others find Nightshade Assassin - Strings of Retaliation by tagging it! Nightshade Assassin - Strings of Retaliation has not been reviewed yet. Nightshade Assassin - Strings of Retaliation has not been recommended yet.